Either place the spinach in a cloth towel and squeeze out all of the water or place the spinach in a strainer with something heavy placed on top to squeeze the water out. Lay the bacon slices out on a baking sheet pan and bake until the bacon is crispy. Once cooled, cut the bacon into small pieces. Cut the artichoke hearts into small pieces. Mix together the drained spinach, bacon and artichoke pieces. Blend in the mayonnaise, sour cream, onion, ½ of the mozzarella, salt and pepper. Scoop the mixture into an oven proof baking dish and top with the remaining mozzarella and the parmesan. Bake at 350 degrees for 25-30 minutes or until lightly browned on top. 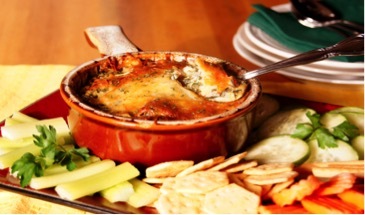 Serve with an assortment of cut vegetables and crackers.